A couple of days ago I finally made a sculpture that I've been wanting to make for at least five or six years. 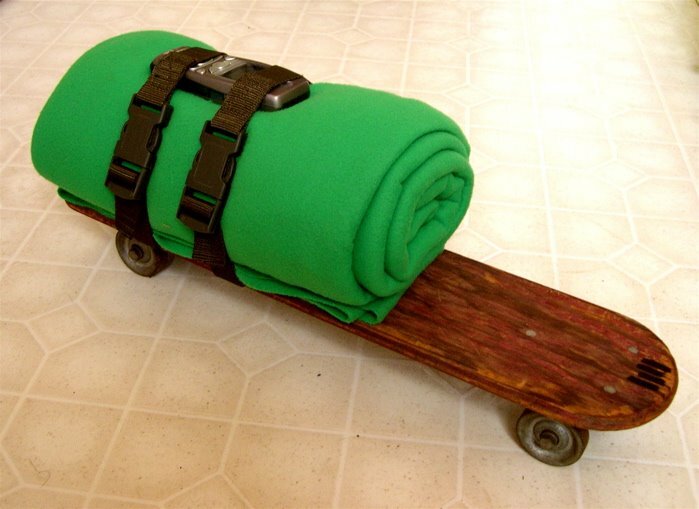 It's called "'Load' (aka 'Sled')" and is my updated version of one of Beuys' sleds. Instead of sled, felt, flashlight & fat mine has skateboard, fleece, cel phone & (not pictured here) a 3600 Calorie Emergency Ration Food Bar. Coast Guard-approved, of course. I'm going to donate this piece to Intersection for the Arts next week for their "State of the Nation" auction, which is Thursday, June 29, 7 PM (Live Auction 8:30 PM).